Chrichton's World: Review Mandy (2018): Beautiful, weird and arguably Nicolas Cage's best film he has made in a long while! 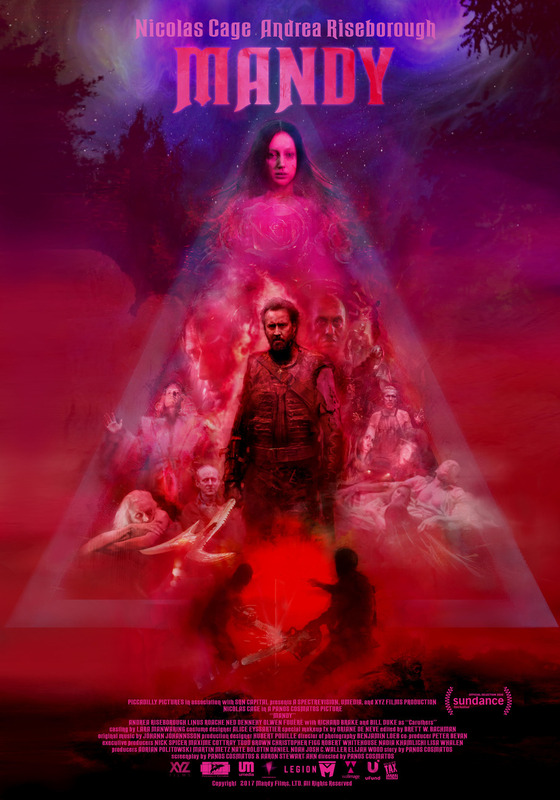 Review Mandy (2018): Beautiful, weird and arguably Nicolas Cage's best film he has made in a long while! A few months ago I was browsing through the latest film titles and Mandy popped up. It was advertised as a horror film and that it would feature Nicolas Cage. Since Cage has specialised himself in doing real bad direct to video productions I wasn't exactly psyched to view this. Until I had seen the trailer. It blew me away. I can't even remember when a trailer had made me this excited. So now I finally watched the film. And it certainly resonated with me. But truth be told I am not entirely sure why. One of the biggest and strongest elements are the visuals and cinematography. Almost every scene is visually stunning, mesmerizing and stylish. Naturally a film needs a whole lot more to work but when done right it can still make an impact. And that is the case here. Somehow writer / director Panos Cosmatos has managed to make me emote to events on the screen with very little plot or dialogue. Almost everything comes from the visuals, soundtrack and the acting. Especially Andrea Riseborough and Linus Roache stand out. Cage is at his best but nothing we have seen before. In the following video Cage expresses his gratitude to Elijah Wood who was one of the producers for convince Panos to cast Cage as Red Miller. Cosmatos simply didn't see Cage as Red. I am trying to imagine what Mandy would have been like had Roache played Red and Cage played Jeremiah. It would have changed the whole dynamics and impact. Roache simply is brilliant as the Jesus wannabe cult leader who is terrifying and someone who should be pitied. In a way he exposes what is the root of evil. To want something you don't really deserve. Of course I am oversimplifying matters. Then again Mandy is not a super complicated film. One could argue it's pretentious with all it's symbolism and fantastic elements. However I felt a sincerity to this film that I rarely experience with most art house films. Now I do need to warn you that while revenge does play a huge part in this film it most likely won't be to the extent you might be expecting. Mandy is quite slow and low on action. Enough violence and gore for sure. But cathartic, therapeutic and satisfying? I don't think so. Once I saw Nicolas Cage forging his super shiny and very lethal looking blade I was prepared for some very gruesome hacking and chopping. And like I said it was present. But nearly not in the way I had imagined to play out. Same goes for the story. I expected a lot more of it. I don't know some twist and turns or more substance. In this regard I was a little disappointed. And yet it didn't diminish my viewing pleasure one bit. I need to point out that this very rarely happens and therefore speaks in favour of Mandy as the cinematic experience it offers. I wholeheartedly can recommend Mandy. Even when I am very aware that this film won't be for everyone. It's too abstract and weird to appeal to the general public. Still it' s a film that proves you can do a lot with strong imagery.